As advocates of the benefits of design thinking, methods and tools we believe that these bring an additional creative dimension to organisations seeking to innovate and co-design new services that are user-centred and user-friendly. 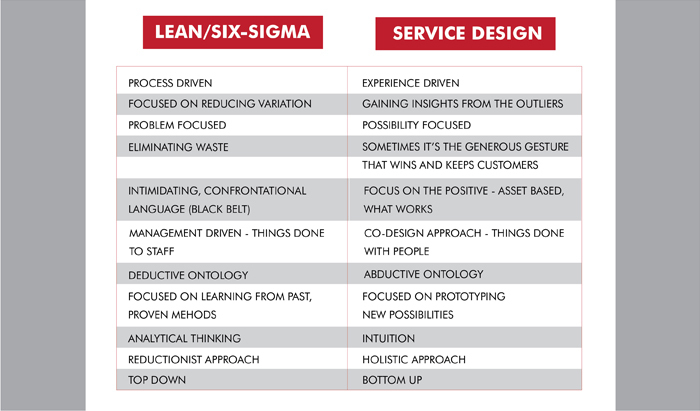 I have put together a table outlining some of the differences I see in LEAN and Service Design Approaches below. Although the different aspects are presented in binary form, we recognise that each item is on a spectrum from the analytic and scientific to the intuitive and creative. To help frame the discussion of the differences between the two approaches I am going back to my roots in architecture and design. Vitruvius, an architect living in the 1st century BC , defined the necessary qualities of architecture as firmitas, utilitas and venustas. Firmitas and utilitas can be translated quite easily as firmness or sturdiness and utility or functionality. Venustas is, however more elusive. Originally translated as ‘delight’ it also has a sense of grace, charm and beauty. Vitruvius’s principles were used by architects throughout the centuries to create buildings which combined sound engineering and aesthetic qualities. The modern movement in architecture, which centred around the Bauhaus in Germany, had a machine aesthetic and technological focus on new materials such as glass and steel and, in seeking ‘truth to materials’, eliminated all ornamentation or decoration in buildings, following the mantra that ‘form follows function’. Whatever your views on architecture, it is recognised that the modern movement, or international style resulted in some very soulless buildings. The stripping away of the principle of venustas (delight, beauty, charm), meant the removal of all extraneous ornamentation which, while ideologically sound, alienated those who were the inhabitants of these buildings. Another interesting point relating to the reductionism inherent in LEAN is that many of the individual components of these buildings were remarkably elegant in themselves. Somehow stripping individual elements back to their most basic form, highlighting the structural properties of the materials used, often (not always) resulted in something of beauty. However some elusive quality was lost when this approach was applied to a whole building. Often these buildings have little sense of the people who inhabit them, no personal touches indicating their character or personality. Using the same formula as the modern movement, LEAN focuses on evidence-based, mechanistic approaches to refining processes and reducing variation, eliminating waste and emphasising efficiency. LEAN and Six Sigma divide processes into discrete parts to be analysed and made subject to Total Quality Management formulae. These can certainly ensure the firmitas and utilitas of the various processes making up a service. But what of venustas? The aspects of delight which give one company, product or service that market differentiation which is such a key component in attracting and retaining customers? What of the personality, the distinctive character of the company? Service Design focuses on designing for experience, emphasising the involvement of the service user in co-designing the service. A service design approach is built on the generation of a deep and holistic understanding of the service user experience, uncovering the ‘touchpoints’ or points of emotional connection (both delight and despair) with a service. Considering the need for innovation and new models of user-centred services, we recognise that many large organisations function with fragmented structures and processes, departmental boundaries and hierarchies, making efforts at integrated organisational change challenging. Organisational Development (OD) experts make a distinction between first-order change, representing incremental changes within an organisation, and second-order or fundamental system change, where the core values and modes of operation are challenged and redeveloped (Bartunek and Moch 1987). I would suggest that LEAN, in its original form, functions as a means of achieving first order change – incremental, process focused improvements. Roger Martin in his book, The Design of Business: Why Design Thinking is the Next Competitive Advantage (highly recommended) talks about the ‘wicked problems’ facing business and society today, which can’t be solved using yesterday’s evidence base. The global recession and collapsing economies, an ageing population and unsustainable public services all qualify as ‘wicked problems’ in their multiple levels of complexity and impact. Martin suggests that design thinking offers the possibility of a context and creative environment for framing these problems in new ways. As we say at Snook, seeing differently, before doing differently. One of the other specific benefits of Service Design is in its participatory approach to the development of new services. Levasseur (2001) has suggested, ‘a fundamental principle of effective change management is that people support what they help to create’. Public sector cuts, particularly, have prompted the need for new models of public service delivery, focused on co-design and coproduction (Cottam and Leadbeater 2004). Without citizen participation and community engagement fostered by public service organisations, it will be difficult to improve penetration of interventions and to impact on health inequalities (Marmot 2010 p151). An increase in participation can also lead to more appropriate and accessible services, while increasing social capital and people’s self confidence and health-enhancing attitudes (Popay, 2006). Wanless (2004 and 2007) in attempting to assess the sustainability of the NHS, produced three scenarios of ‘fully engaged’, ‘solid progress’ and ‘slow uptake’, each related to how individuals might take responsibility for maintaining their own health. Fully engaged was the only viable route to a sustainable welfare system. The NHS Institute for Innovation and Improvement has advocated a ‘design’ approach as offering the potential to produce transformational change in the NHS (Bevan and Robert, 2007). It is obvious from these references to the need for engagement in public services, that the challenge is to win the hearts and minds of communities and individuals to encourage them to take responsibility for their own wellbeing and develop supportive communities with less reliance on public sector provision of services. At Snook we believe we can help public sector organisations approach this new model of partnership working through using design tools and methods first of all to gain the deep understanding of where people are in their attitudes and motivations, secondly to create a democratic and creative environment where service users and public sector organisations can work together to turn recognised barriers and obstacles into opportunities for service improvement. Finally we prototype ideas, working iteratively, testing and refining services in practice, involving service users in co-designing and coproducing their new service models. 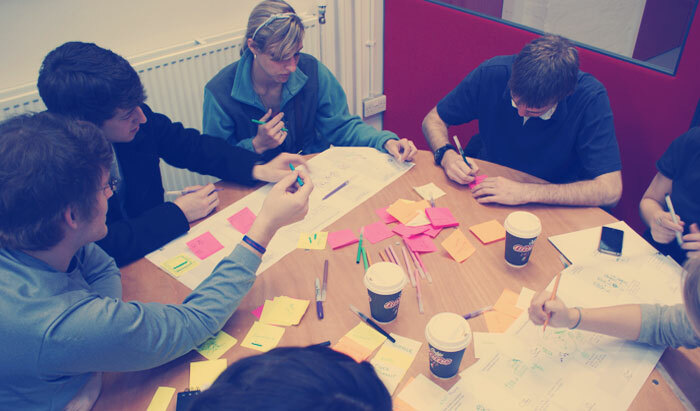 Service Design methods and tools don’t apply only to public sector organisations however – they bring added value to any business seeking to engage in new ways with their clients or service users. Open innovation models have seen more companies partnering with clients to improve and customise products and services. Service Designers are moving from focusing on solutions to specific problems, to providing organisations with the tools and capacities for human-centred service innovation and transformation. So, back to our architectural principles of firmitas, utilitas and venustas. Services with a strong focus on a ‘delightful’ user experience, which adopt innovative models of service user engagement will, ultimately, be the services which stand out in the marketplace and offer the quality and functionality that people desire and need. Bevan, H., G. Robert, et al. (2007). “Using a Design Approach to Assist Large-Scale Organizational Change: “10 High Impact Changes” to Improve the National Health Service in England.” The Journal of Applied Behavioral Science 43(1): 135-152. Carley, K. M. and J. R. Harrald (1997). “Organizational Learning Under Fire: Theory and Practice.” American Behavioral Scientist 40(3): 310-332. Cottam, H. and C. Leadbeater (2004). Open Welfare: Designs on the public good. London, The Design Council. DiMaggio, P. J. and W. W. Powell (1983). “The iron cage revisited: Institutional isomorphism and collective rationality in organizational fields.” American Sociological Review 48: 147-160. Levasseur, R. E. (2001). “People Skills: Change Management Tools – Lewin’s Change Model.” Interfaces 31: 71-73. Marmot, M. (2010). The Marmot Review: Fair Society, Health Lives. Strategic Review of Health Inequalities in England post-2010. London, The Marmot Review. Popay J (2006) Community engagement and community development and health improvement: a background paper for NICE (available on request by emailing antony.morgan@nice.org.uk or lorraine.taylor@nice.org.uk). Wanless, D. (2004). Securing Good Health for the Whole Population. HMSO. London. Wanless, D., J. Appleby, et al. (2007). Our Future Health Secured? A review of NHS funding and performance. The King’s Fund. London.